(CNN) - Former Godfather's Pizza CEO Herman Cain took a moment Monday to clarify his position on Libya: He needs more information. After an uncomfortable eight-second pause to collect his thoughts, the GOP contender explained that he would need to know more before he could unequivocally agree or disagree with President Barack Obama's actions in the conflicted country. "Okay, Libya," he responded when asked whether he agreed with President Obama's actions in the region. Eight seconds later, after looking up, biting his lip and blinking repeatedly, Cain asked, "President Obama supported the uprising, correct?" "I just want to make sure we're talking about the same thing before I say 'Yes, I agree' or 'No, I do not agree." "I do not agree with the way he handled it for the following reasons - um, no, that's a different one," he said, before uncrossing and crossing his legs, shifting position in his seat, and adjusting his jacket. "Let's see, I've got to go back, see," he continues. "(I've) got all this stuff twirling around in my head." "Are you asking me did I agree or not agree with Obama?" "It's not a simple yes/no because there are different pieces and I would've gone about assessing the situation differently, which might have caused us to end up at the same place, but I think more could've been done was, what's the nature of the opposition?" He explained that he would have gotten more information on determining who the opposition was, but said, "I'm sure that our intelligence people had some of that information." Although he declined to criticize the president, Cain said he didn't think enough was done. And before he was challenged on the clarity of his response, Cain asserted, "I'm not trying to hedge on the questions, it's just that's my nature as a businessman, I need to know all of the facts, I would need to know all of the alternatives." "It's not a clear yes/no," he said again. "Because of all those things I think that should have been assessed… I don't know that they were or were not assessed." "I didn't see reports of that assessment." Campaign spokesman J.D. Gordon described the video of Cain's awkward moment as "out of context in some measure." "He just had to think about it," Gordon said, because the candidate "had been getting a lot of briefings on the subtleties of the Arab Spring." Gordon pointed out that Cain had been fielding questions from several editorial board members for 45 minutes and "skipping around from every topic from A to Z." Cain's popularity fell 11 points in a CNN/ORC International Poll released Monday, falling to third place behind former Massachusetts Gov. Mitt Romney and former House Speaker Newt Gingrich. 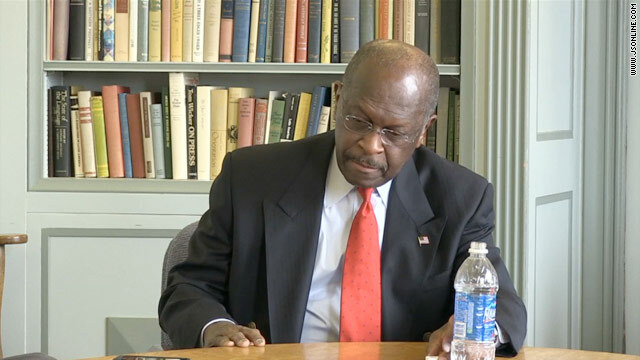 Cain's candidacy has been plagued by allegations of sexual harassment in recent weeks, which he has said are not true. –CNN's Steve Brusk contributed to this report. So cute how Republican'ts so desperately cling to Obama's "57 states" slip-up, and now they have...TWO! Yes, the US has 57 states and territories, and yes, Hawai'i is in the Asia Pacific region (and he was at an Asia Pacific conference in Hawai'i). Pretty minor misstatements if you ask me...certainly not on the level of "Mission Accomplished" or "the HPV vaccine causes mental retardation" or "China has the capacity to develop nukes" or "Ubeki-beki-beki-beki-stan-stan" or "John Wayne was from Waterloo" or "We've got to stand with our North Korean allies" or "Death Panels" or "You're working hard to put food on your family." or etc. etc. etc. All of you Cain haters being condescending couldn't hold a candlestick next to his intelligence. And CNN has NO BUSINESS reporting this is a "Big Stumble". What is wrong with you people? Seriously, sad. This is my favorite comment ever!!! "you are a totol ingnorant "
Maggietag, you will know when the libs have influenced your GOP primary when we force you to nominate that unelectable tool, Mitt Romney, instead of that sure winner Cain. Let's see, hate-filled statements; that would be like "Communist" or "squalor and decadence." I like that last one: both at once? A decadent squalor? How would that even work? Disgusting luxury? Are they living in solid gold tents? When is someone from the GOP going to pull him aside and tell him that he is now just making a fool of himself and a laughing stock of the GOP in general for supporting him? Zeke, you left out "Paul Revere rode out to warn the British that WE were coming," with a press conference the next day insisting that Revere was pro-British. Georgia? You sure he's not from Texas? "I disagree with everything the president has done, has ever thought about and ever will do." Come on Cain, your party-line on all things Obama is pretty easy to remember. What's the problem. He's never done anything right, and cannot possibly do anything right so long as he is the obstacle to the GOP taking more from the poor and giving it to the rich. The GOP is so opposed to Mitt Romney, they will continue to let this clown be in contention. Seriously, is this the best they have to offer. Even his pizza was lousy. This fool did the one thing no one in politics should ever do; take your self seriously and start believing your own hype. He is no Horatio Algers. There was a silver spoon in his pocket in the form of stock given to his daddy from Mr. Woodruff (Coca-Cola). If I was Morehouse College I would ask for my degree back. Obviously, he did not study too hard. Oh well, guess "black walnut" is melting away, slowly but surely. Take a hike Hermie and all your foolish too. If you are not to careful, no one will buy the rest of those lousy books. To Paqrat137: I agree with you – assuming some knowledge of the events being discussed, one should be able to cough up some notions on 1.) what an ideal outcome would be, and 2.) what that person would have done to try to obtain #1. It would be clear that every utterance is largely conjecture, and therefore not worth the air it is stapled to. I believe Cain was being asked to critique or advocate President Obama's performance, hence my stated reservations – that any critique or approval is essentially worthless as it's foundation is largely conjectural – and only serves to invite a flood of vitriol which is equally worthless (but entertaining?). There is considerable backlash on this page to the notion of "gotcha"-questions. I do not condemn them, nor do I advocate them, I simply acknowledge that 1.) they do exist and 2.) attempts to answer them are ultimately useless – meaning, self-defeating. The notion that you can use hypotheticals to accurately measure a candidate – in any dimension other than their patience – seems silly to me. And finally, I would like to make one additional observation: opinions of candidates are almost entirely irrelevant. Being elected President does not allow the President to act on his opinions/feelings/notions/etcetera. Above it has been posited that some candidates are perhaps less intelligent and less moral than might otherwise be desired (I am not asserting that I believe these things to be true). Assume the worst is true, and won the Presidency – what then? Lawless anarchy? The destruction of civilization? Worst case, pundits observe from the side-lines, fuel the engine for the next election cycle, and give someone else a shot four years later. For the record: President Obama may be the single most intelligent, well-educated human being to ever occupy the office. Note the amount of resistance he has met at every decision point: who, realistically, could do a better job, and how? This is (or should be) the substance of the argument, sans the furious hand waving and teeth-gnashing. Frame workable (policy) questions, pose them, survey the answers, pick your guy. Enough games. When did it become wrong to stop and think about question and what your going to answer? Its so funny how every one is ready to attack someone and try to point out faughts were ever they can because thier afraid Obama want get elected again.